Ah, right so. 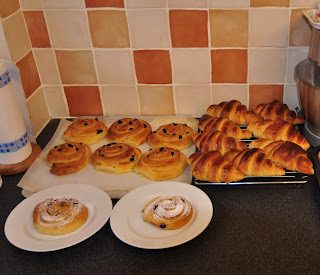 Another good day in the ‘home’ bakery – this is some of what I produced from a batch of around 2kg of sweet, laminated dough. On the left we have ‘pain au raisin’ (aka Danish pastry), on the right classic croissant, which I have now stuffed with creme d’amand (almond custard to me and thee) to end up with the (also) classic almond croissant. I’ve subsequently put some icing on the danish, so they not only look but taste the part: am really pleased with how they’ve worked out and will have to think hard how to improve them. The croissants are good generally, but the egg glaze has gone a bit dark on a few of them, which I didn’t want: I think the solution is to dilute the egg glaze a bit with some milk (as I actually usually do, frustratingly!) before applying, that ought to keep them a lighter brown whilst still allowing the dough to cook through properly. Further thoughts on the almond croissants – the creme d’amand might be better adjusted in this application to be a light creme patissiere flavoured with almond essence – at least that’s what I’ll consider next time. This entry was posted in patisserie. Bookmark the permalink.